I received the product mentioned in this post for the purpose of the review. One valuable thing that every parent should have is a medical kit. The Nuby Medical Kit includes: Sure-Dose™ Medicine Dropper, Medi•Nurser™, Nasal Aspirator with Ear Syringe, Medicine Spoon, Nail Clippers and Digital Thermometer. 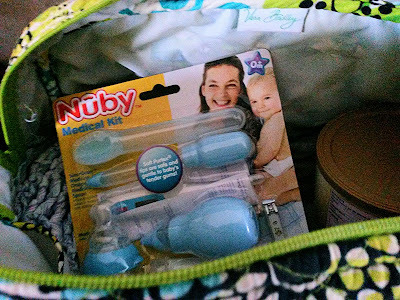 I find that these are all great items to have with me in our diaper bag as well as at home. The thermometer is one thing I find myself reaching for the most, but the nail clippers and the handy pacifier medicine dispenser is also very useful for those little babies! You can find the Nuby Medical Kit on Amazon.com (free shipping with Prime, too!). It's a great gift for any baby shower, or for your own diaper bag!